The Federated States of Micronesia is a country in the northwestern Pacific Ocean. It is composed of four major island groups totalling 607 islands that lie just north of the equator about three-quarters of the way from Hawaii to Indonesia, to the north of Papua New Guinea and the Solomon Islands and to the south of the Marshall Islands, the Northern Mariana Islands and Guam. Tropical; heavy year-round rainfall, especially in the eastern islands; located on southern edge of the typhoon belt with occasionally severe damage; Natural hazards : typhoons (June to December). Present concerns include large-scale unemployment, overfishing, and overdependence on US aid. All visitors arriving in the Federated States of Micronesia must have a valid passport or other travel document issued by the government of the country of citizenship or nationality. The document must be valid for at least 120 days beyond the date of entry. Exception to this rule are the citizens and nationals of the Marshall Islands, Palau and the United States, who may also prove citizenship or nationality by birth certificate or entry permit. If you are going to be in the FSM for less than 30 days you do not need an entry permit. Anyone who will be staying longer than that needs an entry permit. Citizens of the Marshall Islands, Palau and the United States may obtain an entry permit valid for up to 1 year. For everyone else, entry permits lasts 30 days, but can be extended to 60 days. You can get your entry permit on arrival, but if you're travelling for a purpose other than tourism, you need to apply for it in advance. If you need to apply for an entry permit on arrival, you must present an FSM Arrival and Departure Record. This is furnished by a carrier before entering the FSM. You will need a completed application form in addition to this. The major airline that travels to FSM is United Airlines, which operates a thrice-weekly "island hopper" flight (UA155 eastbound, UA154 westbound) traveling Honolulu—Majuro—Kwajalein—Kosrae—Pohnpei—Chuuk—Guam and vice versa. The flight is fourteen and a half hours, leaving in the early morning and terminating in the evening, with a stop of about one hour on each island. There are also nonstop flights from various islands to both Honolulu and Guam. Honolulu is the most direct gateway into the islands from North America. Guam is the most direct gateway from most points in Asia, although it is also possible to fly into the islands from Manila via Palau. Air Nuigini now flies from Port Moresby to Chuuk then onto Pohnpei, with connections/depatures from Brisbane and Sydney amongst other places, for a very reasonable price ~600 AUD return. Our Airline (Nauru Airlines) also flies weekly from Majuro, so it is possible to do a loop from Brisbane-Nauru-Kiribati-Majuro-Pohnpei-Port Moresby to Brisbane for approx ~1.5k AUD using both Air Nuigini and Our Airline. If time is a problem, since all the flights by Our Airline are weekly in one direction on Wednesday and the other direction on Friday, then it is possible to double hop and back track, for example go from Nauru-Majuro via Kiribati, then back to Kiribati, then Kiribati-Pohnpei via Majuro, should you wish to visit all these places. The major international ports are Chuuk, Pohnpei and Yap. There are inter-island trading ships based in these major ports which visits the outlying islands. The "Island Hopper," operated by United Airlines, flies between Guam, Chuuk, Pohnpei, and Kosrae. United also flies from Guam to Yap and Palau. However, it is not possible to fly directly to Yap from other islands in the FSM (you must fly through Guam first). Taxi service is available throughout the islands and is inexpensive. English is the official and common language. Also spoken are Chuukese, Kosrean, Pohnpeian, Yapese, Ulithian, Woleaian, Nukuoro, and Kapingamarangi. Other languages spoken in the country include Pingelapese, Ngatikese, Satawalese, Puluwatese, Mortlockese, and Mokilese. There are also about 3,000 speakers of Kapingamarangi and Ulithian, and under 1,000 speakers of Nukuoro. See the remoteness of the islands, especially Kosrae, the jungles of Ponhpei, the diving in Chuuk, and the traditional culture and stone money of Yap. There are many other things to see on these islands as well. The U.S. Dollar is the official currency of the FSM, no other currency will be accepted. If you are from a country or territory with the US dollar as a official currency, you will not need to worry about understanding prices and currency transferring. Also if you are from Bermuda, East Timor, Panama, or Bahamas, the official currency(ies) of the mentioned countries and territories have fixed exchange rates to the US Dollar. Meaning what price is said in the F.S.M. will be understood with your country's/territory's official currency. Example; $150 US Dollars will equal $150 Bermudian dollars, but you will still have to exchange currencies. You can't legally buy or drink alcohol until you're 21. US citizens and citizens of the territory of American Samoa may live and work freely in this country. The Federated States of Micronesia is generally one of the safest countries to visit. However, there have been some reports of crime in Weno, the capital of Chuuk. 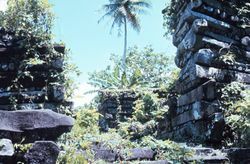 Some islands are very traditional, especially Yap state. Be sure to respect their culture. As a Compact Free Association nation, the Federated States of Micronesia's official postal service is the United States Postal Service. For travel reasons, the USPS treats the FSM as a territory. So the postal requirements in the FSM. are the same in the other CFA nations and the US. This page was last edited on 26 November 2018, at 02:56.